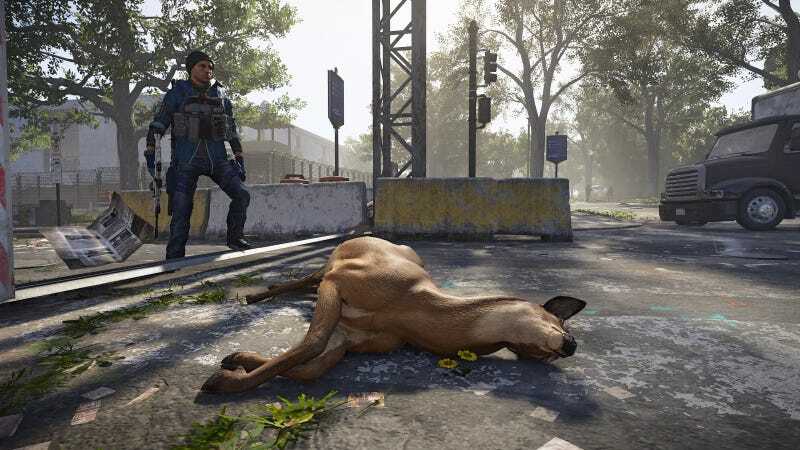 “People have been asking for deer to actually grant food when you kill them,” Yannick Banchereau, The Division 2’s live content manager, said in the weekly Division State of the Game livestream yesterday. “I mean, but then shouldn’t everything provide food when you kill it?” the game’s senior community developer Hamish Bode replied. “It’s probably not going to happen, though,” Banchereau said. The exchange was playful and clearly suggests that, while enemy soldiers in the game will continue to drop guns and gear when they’re killed, animals killed will still drop nothing. The topic had come up while Banchereau was sharing stats about how many bullets players have fired (123 billion) and how many enemies they’ve killed in the game so far (3.9 billion). Banchereau was going to button up that section with a stat on the number of in-game birds killed—1.3 million—but they got onto a tangent that struck me as a worthwhile discussion of one of thousands of choices developers make in every game they create. “We don’t want to incentivize killing animals,” Banchereau said. You could interpret that a bunch of ways, from a moral value about wanting to not depict the killing of animals, a strategic view to avoid upsetting people who would see such a thing as cruel, or even simply as a game design decision. After all, if the birds, dogs, deer and other animals in The Division 2 dropped food or other resources, that might change the player’s approach to gathering in-game resources or alter how they approach combat and optimize their weapons, all of which are ostensibly meant to be tuned to fight against computer-controlled enemies who actually shoot back. That last point reminded me of the way other games have tied an expression of morality to the player’s gain of resources. The original BioShock, for example, gave players the choice between rescuing or “harvesting” the “little sister” characters, who looked like little girls, offering more resources for choosing the latter option. Doing the morally better decision might limit the player’s potential riches, though the difference wasn’t so pronounced as to make the kinder decision that difficult to bear. Arguably, the lack of meat dropped by deer in The Division 2 suggests that killing deer is pointless, though rendering such an action as unrewarding is itself making a point. That you can even kill the deer is itself a design decision, one that is layered atop another decision to even have them in the game world. The deer being there helps convey that nature is reclaiming parts of the game’s wrecked Washington, DC. Them being killable prevents the spell-breaking moment of the deer magically being able to dodge or withstand bullets (players’ guns are disabled when they’re in friendly settlements, but deer run down the same streets where enemies lurk). The dead deer not providing players meat? I like that decision. Sure, if they could be used for meat it would add a logical aspect of survival to the game and would feel true to what people would likely do when trying to cope amid catastrophe. It would also give me another task to do in the game, one that could easily feel gratuitous. Instead, making the killing of deer unrewarding proposes a tantalizing alternative model of The Division. What if killing in the game was literally pointless in terms of providing video game points? What if killing enemies didn’t grant loot or other statistical rewards? What if more of what we did in the game was dictated by what felt right, rather than what got us better loot? It probably wouldn’t make for as fun a game, but the deer at least run around as a suggestion of what another, more experimental version of The Division 2 could be.